In the politically-charged case that has set America's third-largest city on edge, officer Jason Van Dyke shot Laquan McDonald 16 times in October, 2014. Van Dyke faces 23 charges including first-degree murder. A white Chicago police officer testified Tuesday at his high-profile murder trial that he shot dead an African-American teen because he came too close and would not drop his knife. A police dash-cam video captured the incident. The 17-year-old's killing has become emblematic of decades of police abuse in Chicago, and is one in a series of fatal encounters in recent years between US police and African Americans, who formed the Black Lives Matter Movement in response. On the video, McDonald appears to be walking away from officers when Van Dyke begins firing his gun. He continues to shoot McDonald after he falls to the ground. At the trial which opened on September 17, defense lawyers have argued that the video does not show Van Dyke's perspective. Taking the stand in his own defense Tuesday, the 40-year-old testified that he began shooting McDonald because he raised his knife and "never stopped" advancing towards the officer. "His face had no expression. His eyes were just bugging out of his head. He had these huge white eyes just staring right through me," the officer said. "I was yelling at him to drop the knife," Van Dyke said, at times appearing to wipe away tears. "He got probably about 10 or 15 feet (three or four meters) away from me." Van Dyke said he fired a second round of bullets because the teen was still clutching his knife while on the ground and appeared to be trying to get up. "I just kept on looking at the knife and I shot at it. I just wanted him to get rid of the knife," Van Dyke said. None of the other nine officers at the scene fired their weapons. Prosecutors said the video -- recorded at night from some distance and pointing at the teen's back -- did not capture McDonald raising his knife or trying to get up. The highly-anticipated trial has led to fears of possible violence in the Midwestern city if the officer is acquitted. 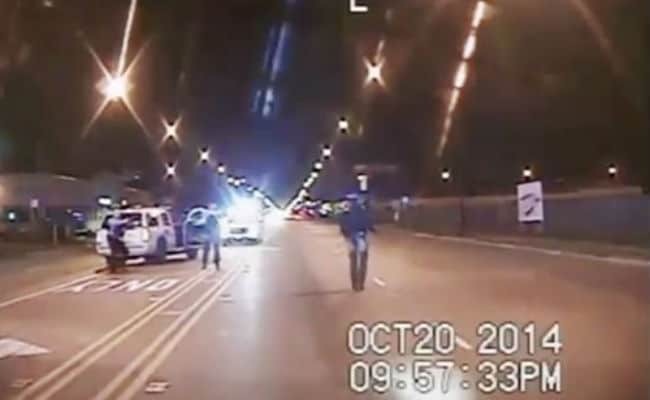 Van Dyke was not charged until the day the video was released in 2015 -- a year past the incident and only after city officials were compelled by a judge to make it public. Protesters demonstrated for months, alleging a cover-up and demanding resignations. Chicago's then-police chief and top prosecutor both lost their jobs.